"Off Duty" 8x8 inch original mixed media (paper and acrylic) painting on wood panel. Today was a blissful day of painting, and I finished this new piece. 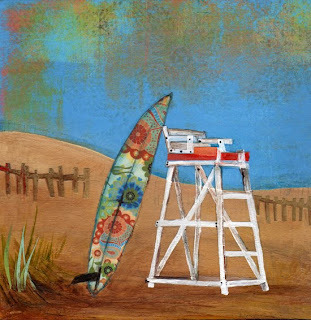 It's #8 in my surfing series and the only one still for sale. I don't have the original posted yet on my website, but I have prints already available here on Etsy. I also moved my studio downtairs in order to cool down from the heat. We are having a heatwave in NY at the moment, and it's nice to be able to create downstairs in my new cave. Thank you, Christophe, for taking the little ones today!! "Birdie Garden" in the Nursery! One of my clients was kind enough to send along of photo of"Birdie Garden" framed and hung in her baby's new nursery. I love the way the birds in the mobile compliment the birds in the painting, and the wallpaper is so cool! You can see more of this beautiful & creative baby space here on Melanie's blog.